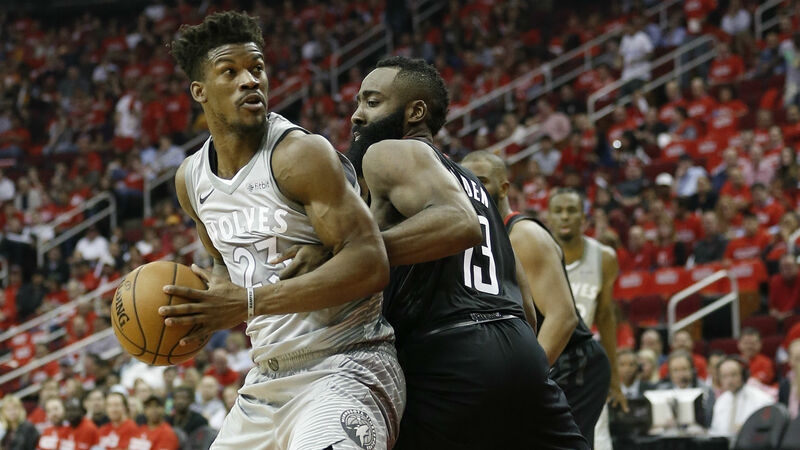 NBA trade rumors: Would Timberwolves move Jimmy Butler for these trade packages? The Timberwolves travel to San Antonio for their regular-season opener on Oct. 17. Jimmy Butler is still a member of the team. This is a problem. Minnesota’s asking price for Butler is reportedly so high that Butler and his representatives are wondering if president of basketball operations Tom Thibodeau and general manager Scott Layden are making a genuine effort to trade him. The Timberwolves’ front office could be trying to drive up offers, but both Butler and the Wolves should want to finalize a deal before this turns into an all-out catastrophe. Why it would work: Winslow is entering his fourth NBA season, but he’s still only 22 years old. The former Duke star has great potential on both ends and could slide into Butler’s place in the starting five. Johnson is a tough, gritty forward — don’t mess with a guy who is known as “Bloodsport” — which should be perfect for Thibs. Throw in that pick, and it’s a decent haul for Minnesota. The Heat send out a couple of building blocks, but they don’t lose Josh Richardson, and Butler could be re-signed in the offseason. Why it wouldn’t work: Richardson could be the dealbreaker here. Don’t let his modest numbers fool you (12.9 points, 3.5 rebounds, 2.9 assists per game) — Richardson has the chance to develop into a two-way star. Richardson believes he is already a top-10 defender in the league, and at 25 years old, he is just now entering his prime. The Timberwolves should want Richardson included in any deal, and the Heat should make him off limits. It’s a stalemate. Why it would work: If Thibodeau wants to remain in win-now mode, then he could do worse than snagging two guys capable of dropping 20 points per game. Harris fits nicely as a power forward next to Karl-Anthony Towns at center, and Williams provides instant offense in the backcourt as a starter or off the bench. The Clippers bring in Butler for a full year and give him the Paul George-style pitch ahead of free agency next summer. Why it wouldn’t work: Is this the route the Timberwolves want to take? Again, it’s a win-now move, but what happens beyond this season? Harris is set to become a free agent in 2019 and should command a big contract. Minnesota might not want to commit to Harris given how much the team has already spent on Towns and Andrew Wiggins. We already know what Williams brings to the table. The Wolves should be asking for Shai Gilgeous-Alexander, but the Clippers shouldn’t go anywhere near a deal involving both Gilgeous-Alexander and Harris. Why it would work: A young prospect, solid veteran and a draft pick — that checks a lot of boxes. Ntilikina is only 20 years old, so he is an unknown quantity at point guard, but he has a lot of intriguing tools as a defender and playmaker. Lee is a 3-point threat (40.6 percent last season) for a Timberwolves team that took the lowest number of 3-pointers per game (22.5) in the NBA last season. The Knicks place a legitimate star next to Kristaps Porzingis and position themselves to make another splash in 2019. Kyrie Irving, perhaps? Why it wouldn’t work: New York wants to be patient. (Yes, this is a new concept for the front office.) Sporting News’ Sean Deveney reported in late July that Knicks president Steve Mills and general manager Scott Perry won’t panic if they can’t land game-changers like Butler and Irving. The Knicks don’t want to make a splash without a plan — understandable considering the team’s recent history. As for the Wolves, this feels like the offer to take if everything else dries up. It doesn’t move the needle all that much. Why it would work: Three-teamer! Let’s get weird! The Rockets form a potent trio with Butler alongside James Harden and Chris Paul. Butler could run isolations on the offensive end and provide versatility on defense. Beating the Warriors requires stars, and this would be another elite option for Houston. The Timberwolves acquire a starting shooting guard in Eric Gordon (an immediate upgrade over Derrick Rose), plus a few other pieces that add some depth. The Kings are a dumping ground for unwanted salaries, but the pick is attached to make them happy. Why it wouldn’t work: Eh… this is just too weird. Harden and Paul proved they could work together last season, but what happens with three ball-dominant guards in the starting lineup? Is that the best the Timberwolves can do? Would the Kings really want to help facilitate this just for the pick? (Well, we can’t rule anything out with the Kings.) Sure, three-team trades are fun, but this one doesn’t seem like the best option. Back to the drawing board for Daryl Morey.